Titia travels in the summer on business and spends nights camping on farms in her van. She has a system for van camping that works. 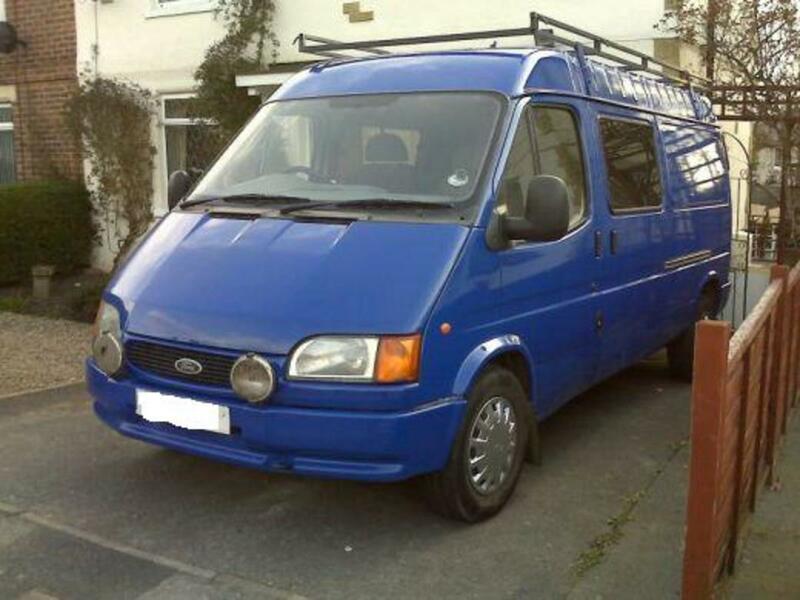 We own a 13-year-old Ford Transit Van with a double-high roof. 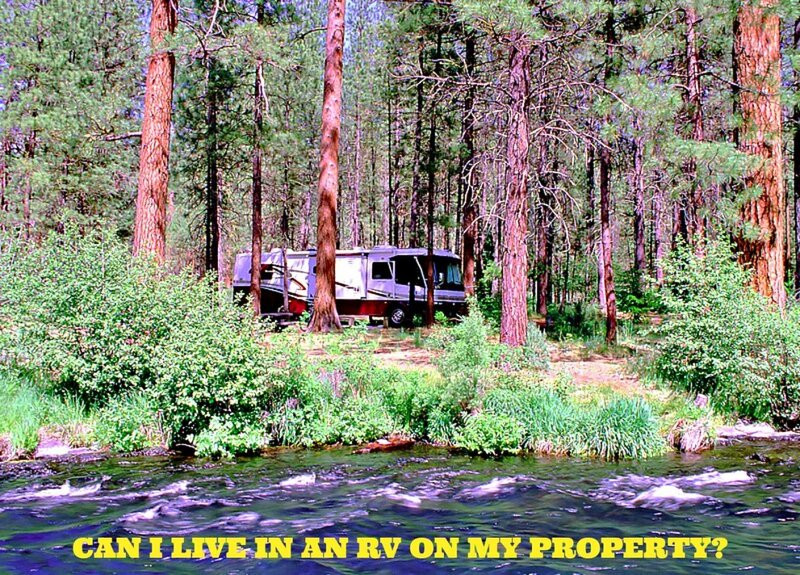 We use it for all kind of things, one of which is as a one-person camper. I'm a sheep breeder and an inspector of our very rare Dutch sheep breed (Drenthe Heath Sheep). In summer (July and August) I travel through my country in the weekends to inspect the sheep of our breeders. I don't like to sleep in hotels or B&Bs, but I love camping. So I turn my big van into a temporary camper. That way I'm independent. On the map below, you can see where I have to travel to in my country during the months of July and August. Most of these trips involve over a two-hour drive from my home (sometimes as much as a 5-hour drive). Inspecting sheep the whole day long is exhausting. I would get in trouble if I had to drive long hours first, inspect the whole day, and then drive long hours back. I would fall asleep in the car, and we don't want that to happen. I like to go trout fishing too. I always search for a fishing pond in the area where I have to be and then search for a nice small campground nearby. I don't like the big, noisy family camping sites. They have strict rules on when to arrive and when to leave. Most of the time they don't correspond very well with my time schedule. 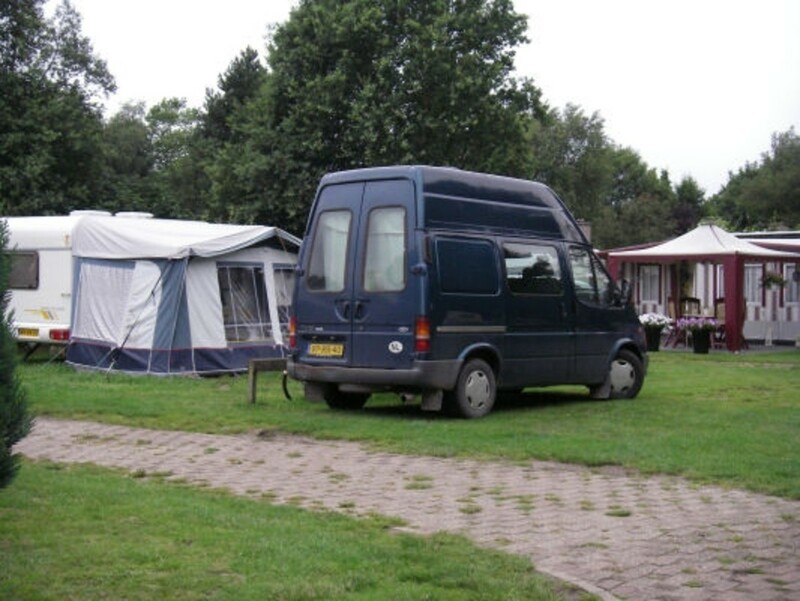 In The Netherlands we have an organization called SVR Camping Sites. 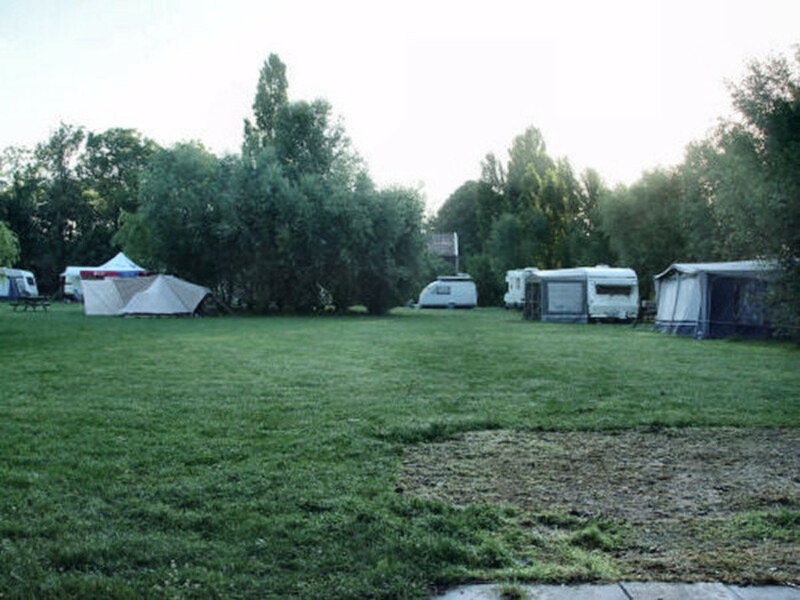 Membership is cheap and they provides addresses of mini-camping sites at active farms. Those are small sites of 10 to 15 places max, and you can camp either in the meadow or in the orchard. They don't charge much for one night, and all have nice and clean toilets and showers, plus electricity. I love to camp there. 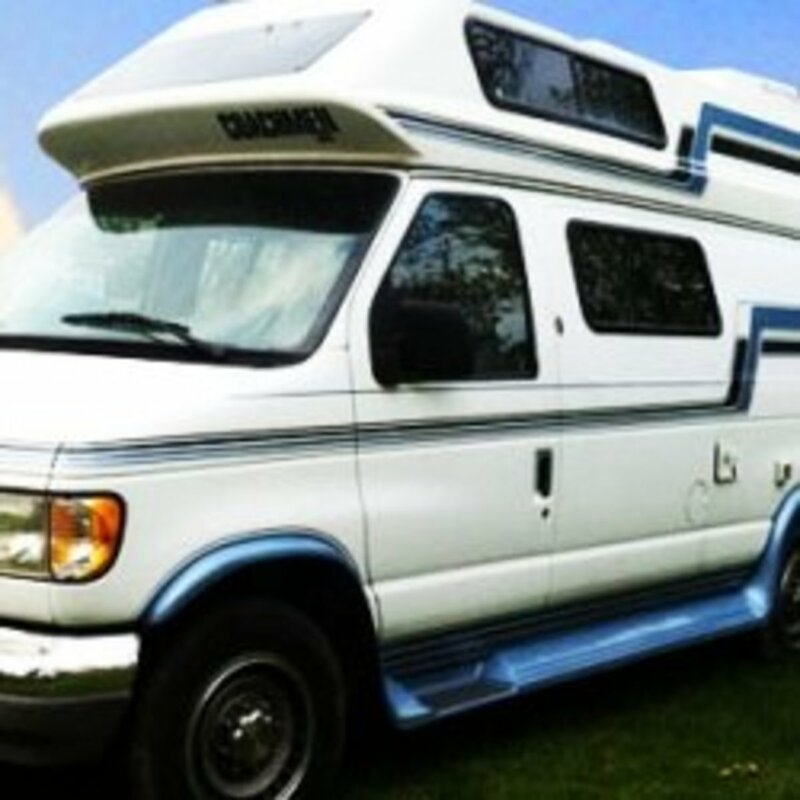 When you plan to turn your van into a temporary camper, you need to make a 'what do I need' list. What you need depends on how basic you are willing to camp or what form of luxury you think you can't do without. I'm not a young teen anymore. I've had two hip operations and I can't sleep on a mattress on the floor anymore. I would have big troubles to stand up in the morning. So I put a complete bed in my van. It fits perfect and a great pro is that I have room underneath to store some stuff. I used to take my dogs with me and then I used a different kind of bedding because they needed their benches to sleep in. We set the benches apart from each other and put an old flat door on top of it and on top of that I put the mattress. It was a bit high so I needed a stepup to get in bed. Once in bed I couldn't move too much because the benches would move along. The dogs got used to that though. I don't take them along anymore. In summer it's getting too hot in the van for the dogs. Besides that, not all camping sites allow dogs. Once in a while a woman has to go to the room where even the Queen is alone. Those rooms are not always available when you need them. I found this 2.8-gallon portable toilet and I have used it ever since to my great satisfaction. I love being self supporting. Today I even take my portable toilet along when I'm not camping. It can be so darn convenient at times you know. When you're planning to buy such a toilet don't forget to buy the necessary chemicals too. You need them to keep your toilet clean. When you're on the road for a couple of days, you need at least one cooler to keep your stuff cool. I take along two coolers and a whole bunch of ice packs. 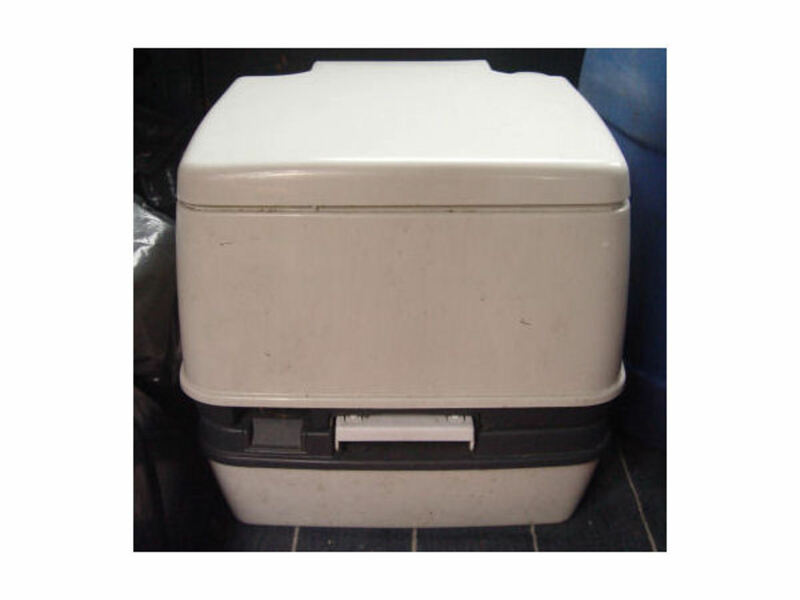 I use the non-electric cooler for my own stuff and the electric cooler when I catch some trout or salmon. I love to go fish between sheep inspection. 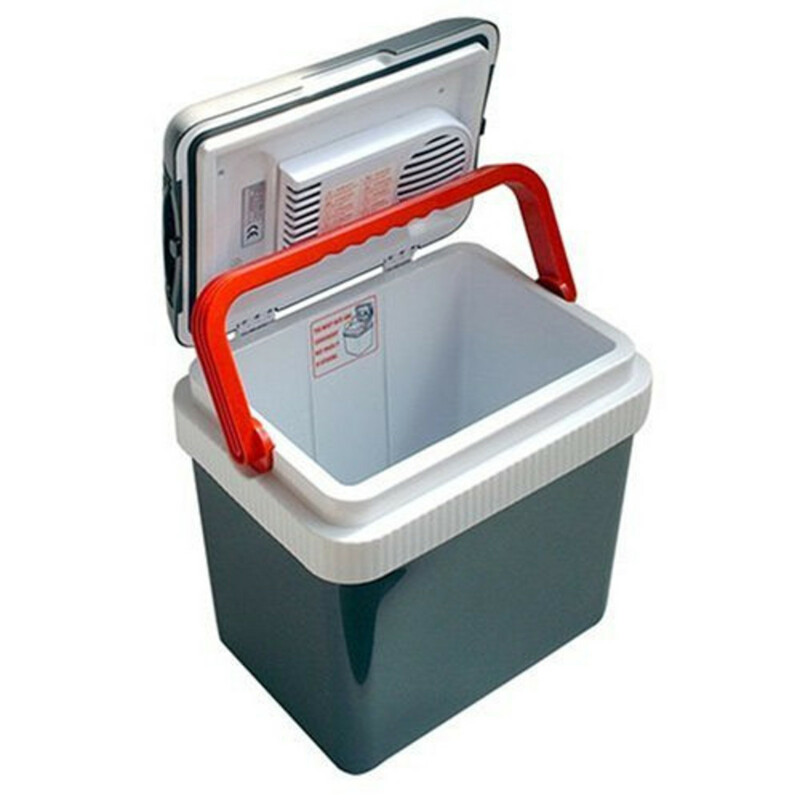 The Koolatron P25 26-Quart FunKool Cooler looks like the electric cooler I use. 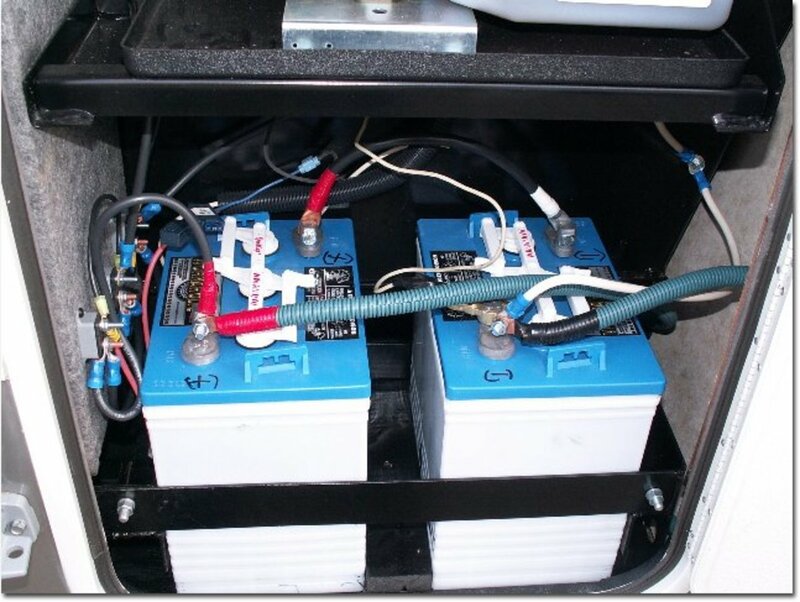 These coolers can either run on your car battery or on electricity. I always take a load of ice packs with me, because they keep the cold in much longer. Sometimes I'm lucky to hit a camping place where I can put them in the freezer for the night. Sometimes I fill empty bottles with water and put them in the freezer. They function like ice packs too. 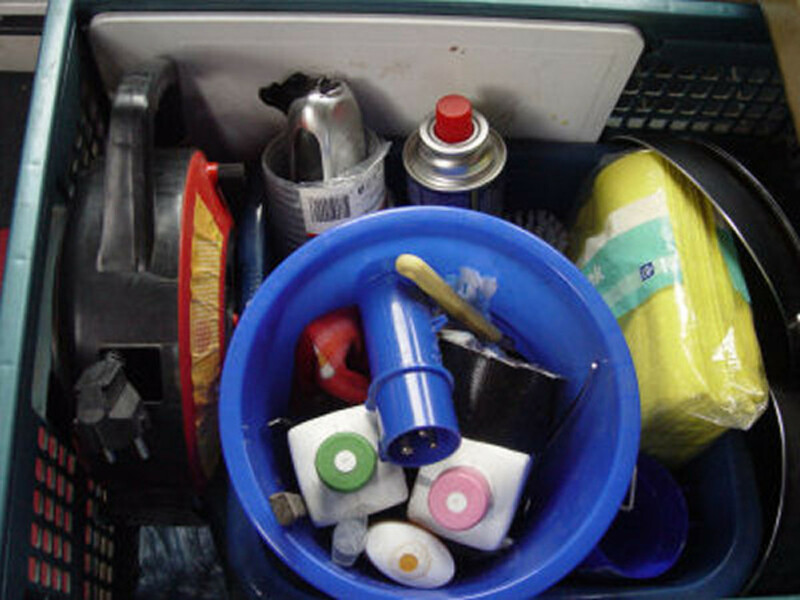 A freshwater container is a must when you're travelling long distances and are camping in a Van. You can use it for your portable toilet, clean your boots, and do the dishes. Choose one that's not pliable, but rather firm, because it should be able to stand a bit of rough handling. 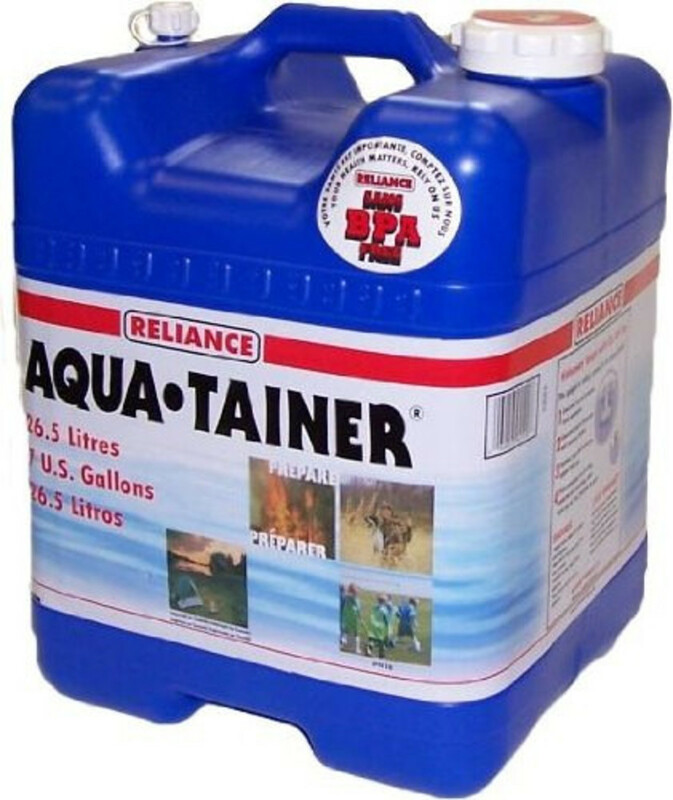 I use a water container like this 7-Gallon Rigid Water Container only mine has no filter. I've never seen those in my country, but if I had a choice, I would've bought one with a filter. Why? You could end up in a situation that you have to drink the water. Then it's always safer to have filtered water available. 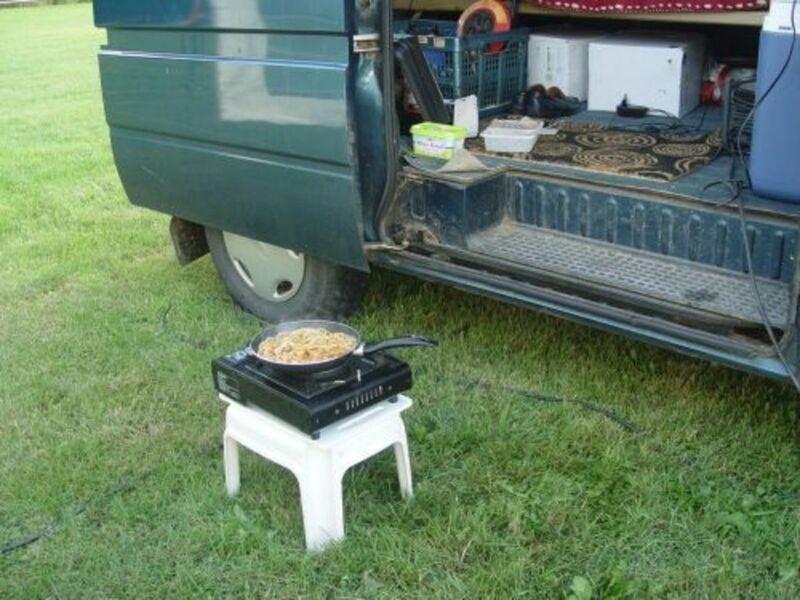 In Europe you can't do without a camping electricity converter. 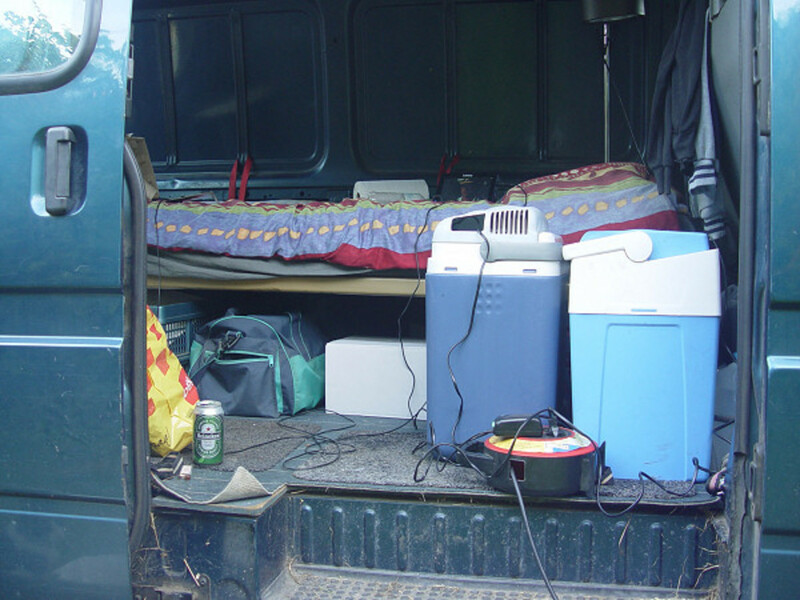 Most camping sites have a lower voltage than the normal 220 in houses in Europe. I don't know if that's the same in the USA or other countries outside of Europe. I use a normal cable reel and then I need this converter to put the cable into a socket. I have two cable reels, so I can cover quite a bit of distance. Sometimes the electric point is a bit far from where I can place my van. I used to take only cold food like buns, butter, cheese, some pastry, and fruit with me. For dinner I often bought some French fries or other fast food. Those snackbars are not always available and I didn't want to eat fast food all the time. So I bought a one pit burner to cook my own hot meal. I love my Portable Butane Gas Stove. After a long day of inspecting sheep I love to make a hot cocoa. I can boil some eggs, and even cook a meal. Sometimes I eat a fresh caught trout for dinner. You might think you don't need much when you go camping for one or two nights. Take it from me, if you don't have it, you sure going to miss it. I once forgot a spoon and a knife and you don't want to know how I ate my meat and pudding. I use a crate that's always packed with all the things I need. So when I have to go on a trip, I only have to pack that crate and I've all the stuff I need. This van doesn't have much light in the back and if I use the lights too or my car battery will die. At a camping site when I have electricity I take along an old floor lamp so I can read a few pages before going to sleep. Having some extra flashlights is important when you have to go outside in the middle of the night. I always carry at least one, but two is better. In my Van I have windows at three sides, the front, the back and the side door. I use old, but nice bed sheets to cover the windows and they stay in my 'tool' crate, so I'll never forget them. I also use them when I have to use the portable toilet. In the back I span elastic binders and I hang the sheet over them. In the front and on the side I use clamps to tighten the sheets. It's very easy to hang them and very easy to take them off. I also take some extra blankets, because it can be rather cold at night, especially in Fall season. I do not travel only in the summer, but also in the fall season and winter too. I needed something to keep me warm in the evenings. In the local camping shop I found this cute little fan heater, made for campers. Mine looks almost the same as this Ceramic Fan Heater. The beautiful part is, that these heaters are very safe to use. When knocked over they stop immediately and nothing can get burned. I never let it run at night though. I'm warm enough under my eiderdown and a fleece blanket. 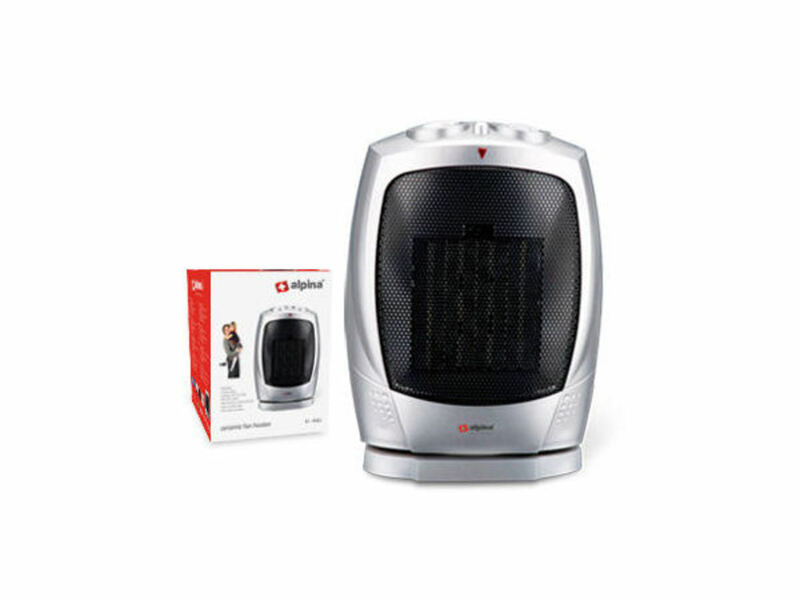 I do use it in the chilly evenings when I watch a movie on my laptop. I keep all the stuff I need for these short trips in separate boxes, so I don't have to go looking for stuff when I have to leave. All has its own place, even my fishing gear. I once forgot my bag full of clothing and it was a four day trip. First thing in the morning I had to find a store like Walmart, to get some basic clothing. Not easy in a place without big cities. You always discover something missing when you're too far away to turn back to pick it up. From today on my dear old blue Van will be history. After 20 years of joy I have to say goodbye, because her body is rusting away. She won't pass the yearly inspection anymore. Too much corrosion underneath to be safe. These vans are very hard to find in the second hand market. Most of them don't have an increast roof and very few have automatic transition. Last month we stumbled upon one that would fit our need. The roof is not as high as the present one, but high enough for me to go around in. 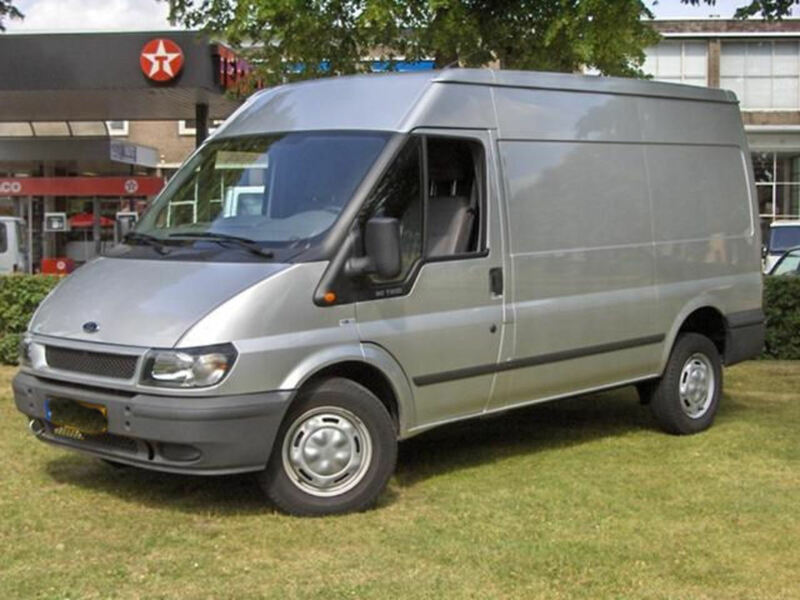 It's 12 years old but has a very low mileage, so we decided to buy it and will trade-in our old van. Today I will drive my Van for the last time and I must confess: I'm feeling a bit sad. After 20 years this van has grown on me. After using this 'new' van for a couple of years, I must say that I don't miss my old blue van at all. I thought I would miss the windows at the side and the rear, but after all I'm very glad that this is an all around closed van. It actually gives me a very safe and pretty feeling that nobody can see me when I'm sleeping in it. Not even when they try to peep inside from the front windows because it's very dark in the back. Besides that, this van is also a bit longer than the old one, which gives me more room inside. We did some camping in our converted van about 25 years ago in Australia. It worked pretty well for some outback treks. Comprehensive! You are busy. Hope it's lots of fun, too. @Nancy Hardin: I could have slept in a VIP cottage at the local Center Parc Holiday Resort. It was offered to us to use it this weekend for free. Four of the other inspectors are sleeping in the cottage, but I prefer my van. Did some fishing tonight and caught two big trouts (about 1 kilo each). Sounds like you're well equipped for just about anything. Great that you can be self-sufficient on the road. Take care, and thanks for sharing. Hi you know I think this is the prefect way to travel. I love the way you have your van setup. Great pictures. I don't watch much tv, so my Kindle Fire would travel with me. Thanks for sharing. @GardenerDon: I don't think there were even kindles at the time I got my lenco tv. I like to read too, but I don't like the electronic gadgets like Kindles. I like to hold the old fashioned book in my hands and smell the paper and ink. I collect children's illustrated school books, among other books and my oldest school book is one from 1904. I think I could easily fill a library with the books I have. The only thing I'd do different is trade the portable TV for a Kindle! I'm more of a reader than a TV watcher &amp; reading seems more in tune with the whole concept of camping to me. Loved your pics! Some really great ideas. Thanks. This is a really well done lens. Thank you for all the great ideas. Very nicely put together lens! I enjoyed going through it! Love it. Very down to earth and humorous to boot. Made me smile. Thanks for the memories. I used to travel/camp in a van and I loved every minute of it. Blessed. @anonymous: Hi, thanks for visiting my article. 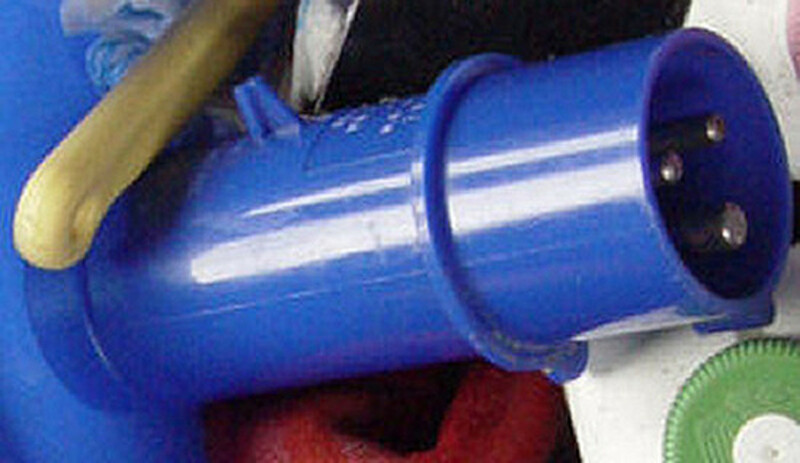 The clamps are not attached as in permanent. 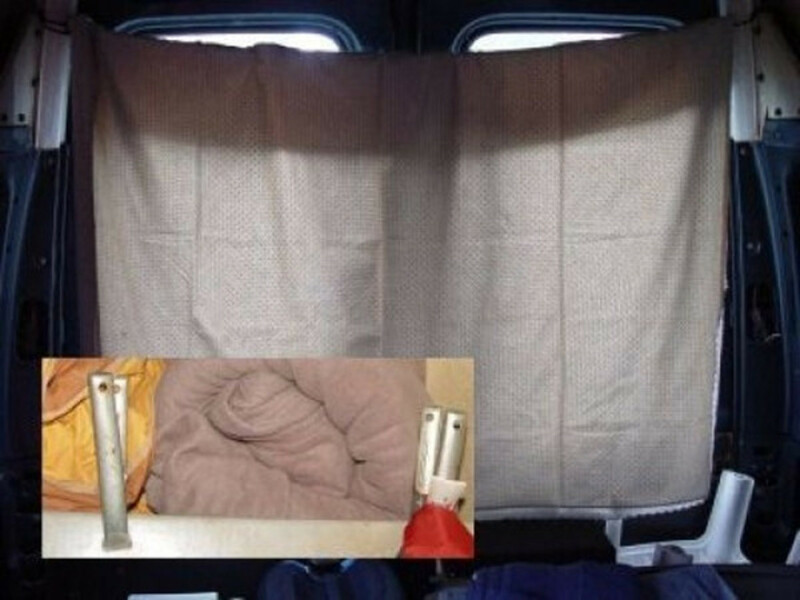 There are ridges in my van and I just fold the sheets over it and put the clamp on top. At the back I use elastic cord and hang the sheet over it. Good question, I'll need to explain that better. 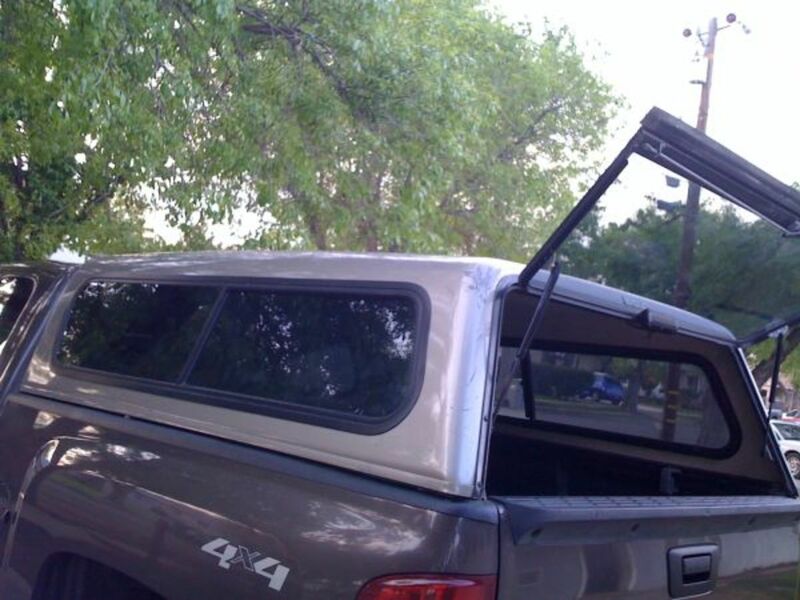 A question, how are the clamps that hold your curtains up attached to the car? I love any form of camping. Thanks for a great and complete lens. Perfect complex lens, I just need to get some van and let's go! I always wanted a campervan, and these days it's a lot easier to work on the road, with internet and mobile phones and satellite television. 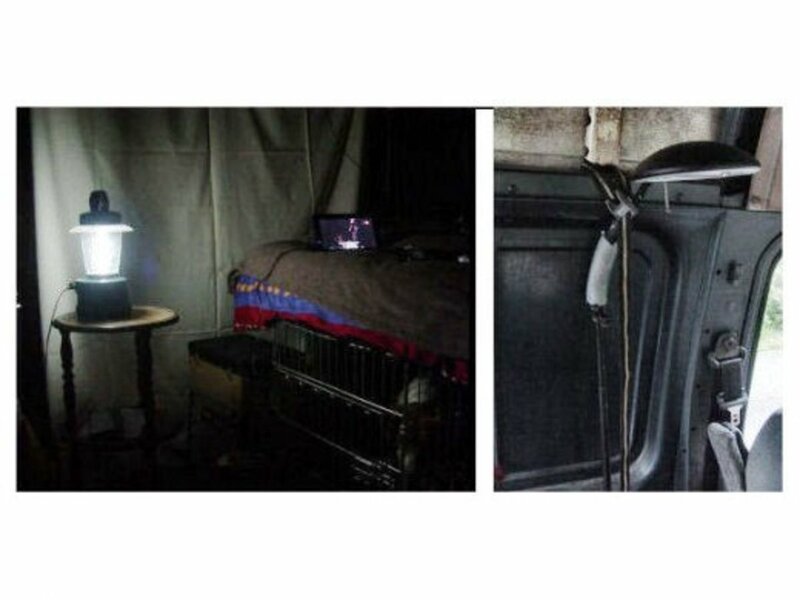 You seem to have things worked out really well in your van, I think camping like this is really practical, and a lot cheaper than using a hotel. I think I would make sure the toilet and cooler were different colors. Don't want to mix that up in the middle of the night! Great topic! Well written lens. You've covered everything about camping/road trip. Just fluttering over once again. I sure miss the camping van that we had as it was so nice to just pull over to the side of the road for a nap if needed. They really are a handy vehicle to have if you travel. 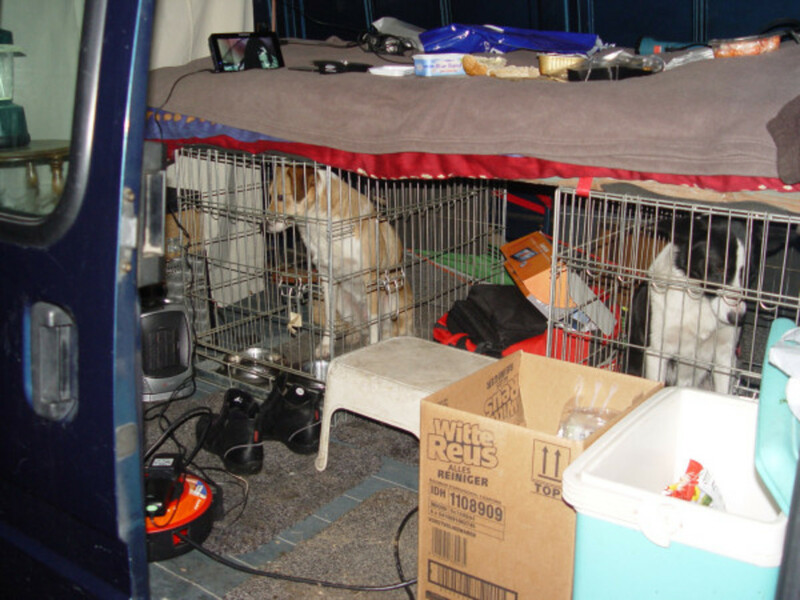 Titia, it looks like you can be completely self-sufficient in your van when you travel. I would think staying warm would be one of the biggest challenges when you have five degree below temps. I can see where the heaters are a must! I enjoyed your lens. what a great write up on this topic, who hasn't slept in the vehicle, right! I enjoyed this so much, camping in a van looks homey to me. Love how you put the dogs pens under the bed to save space. I also have a van. I haven't used it as a camper yet but I bought it with that idea in mind. I love your lenses that are about you managing life - Angel Blessed. Extremely informative and personalised lens. Really well put together and a good read. I have blessed it. A person after my own heart. I have an old 1986 Toyota Hippie van - it even has flowers painted on it and a bed in the back. During warm weather I camp in mine as well. Enjoyed this lens. Nice to meet you. I enjoyed your lens.I loved camping with our van. We had an 8 seater Mitsubishi Delica which we used for camping trips around New Zealand. The two back seats folded more or less flat into a double bed. We added some padding for a more comfortable sleep. The more we went away the more organised we got. We sold the van more than 3 years ago and I still miss the van and the good time we had with it. I love it. This is my style of camping...in a van. 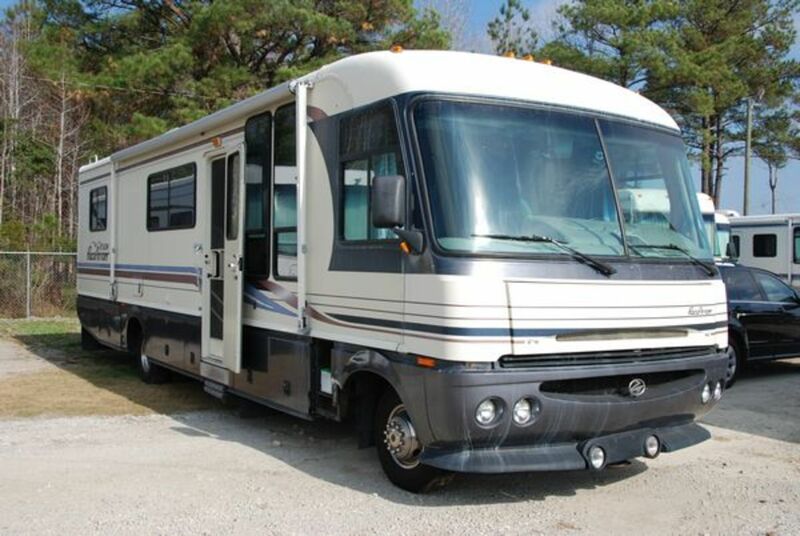 I actually believe it to be so much safer than a travel trailer as you can just hop into the front seat and drive away if there is a need to. Thank you for this delightful peek into your world. @justholidays: I had a lot of fun, but I'm not done yet, second round of inspections starts next weekend and then in September or October I have to go to Luxembourg. @LisaAuch1: Thank you so much. @Shoputopian: You're welcome, glad you enjoyed it. I love this! We are lookingat buying a camper van and found a double transit fitted out, basic but just what we need, and now we can see how the dogs get on with you make us even more excited about this! you have a wonderful lifestyle i love the picture of your dogs looking over the fence! Dinner! 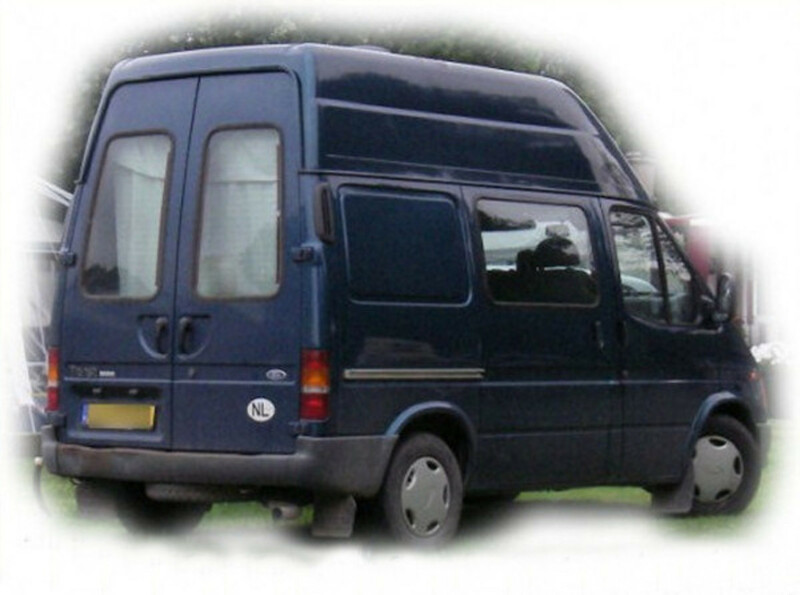 Wonderful page on how to convert your VAN! Loved all you post.You are one fantastic lady.